Murder. Innocence and guilt. Justice. Ghosts. Vengeance. The Ghosties and Ghoulies Haunted Hike in St. John's, Newfoundland, shared all that and more. We started out at the Anglican Cathedral and hiked the hills and streets of downtown St. John's. There were two groups of about 40 people each (this is a popular event in town - rightly so!). Each group was led by a guide, a costumed storyteller with excellent theatre training. We stopped at places of paranormal activity and learned the history of what occurred there. It was very entertaining - we were completely engulfed in the story. 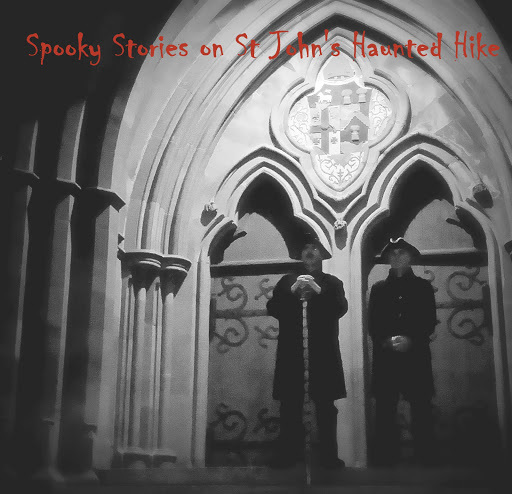 Our storyteller was very knowledgeable about the history of St. John's, and gave us the history of the town whilst teaching about the ghosts and gruesome stories of its inhabitants. How did you start the haunted hikes? In 1997, I was visiting a friend in England, and we went on a ghost tour in the city of York. I loved it and thought that a tour like it would work in Newfoundland. That year was the Cabot celebrations in Newfoundland, so I came back, did the research, and put together the tour for that summer. I never thought it would take off like it did, or that I'd be still running the tours many years later. All my stories are true, of course! They are all "true" pieces of Newfoundland folklore; I don't create stories from nothing. All my stories are based on things I've collected from people who have had strange experiences, or who have heard old local tales. At heart, I am somewhat sceptical myself. Having heard and read hundreds of ghost stories over the years, there are some stories I come across and immediately recognize as being urban legends or myths that are found in many parts of the world. At the same time, however, I've met a lot of people who have had a lot of very strange things happen to them, so I am certain that there are things that happen in the world that we cannot easily explain. How does storytelling translate for a planned walk - how much do you have to depend on the environment to create your walking itinerary? And how much research did you have to do to find the stories? I'm very dependent on geography and streetscape when planning the physical route of a tour. I need places that have interesting stories, but which are also conducive to good storytelling. The stops on the Hike need to be interesting to look at, but also quieter or more sheltered, to make my stories more audible to the participants. I started to learn about the haunted history of St. John's by reading books by Newfoundland authors like Jack Fitzgerald, Mike McCarthy, and Frank Galgay. They have all done a lot to promote the history and folklore of the city. As I became more involved with running the Haunted Hike, and writing for local publications, I started to do interviews with people who have had strange things happen to themselves. Today, that is one of my favourite things about the Hike. I love having people share their stories with me, and I'm always keeping my ear open for new tales. I also get a lot of emails from readers and from people who have taken the Haunted Hike, and I'm always excited to find a new ghost story in my email inbox! What might people be surprised to find out, about the haunted hike? I am amazed at how many stories there are out there, and how many people have had eerie things happen to them. I constantly meet people who have a ghost in their house, or who know local legends about phantoms or fairies. I think the two books I've written just scratch the surface of the material that is out there. I also think that some of the older stories are starting to die out in some places, particularly the stories about old beliefs and local happenings. I would encourage people to talk to their relatives, particularly the older people in their families, and to write down these stories before they vanish. Once those bits of folklore are gone, it is hard to bring them back. There is not one specific type of person who takes the Haunted Hike. I get school kids, teenage Goths, blue-haired old ladies, tourists, locals, families, young couples on dates, true believers and doubters. I've done tours for executives, judges, choirs, urban planners, and rugby players. Everyone loves a ghost story! Thanks, Dale! We loved our haunted hike so very much - highly recommended! Photos courtesy and copyright Chris Hibbs, except where noted.